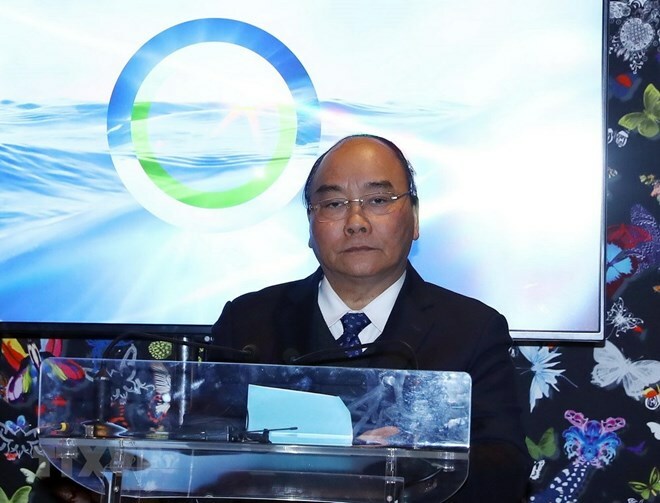 Prime Minister Nguyen Xuan Phuc lauded efforts in sea and ocean governance in his address at the world leaders’ meeting on taking action for the ocean in Davos, Switzerland, on January 23, the first event within the framework of the World Economic Forum (WEF)’s Annual Meeting 2019. He called for creating breakthroughs in the field, including effectively pooling and allocating resources to cope with serious challenges arising from climate change and rising sea water, and support countries hardest hit by the changing climate. The PM suggested establishing an open public-private partnership forum on climate change response and marine ecological environment protection in order to facilitate experience sharing, technological transfer and attract businesses’ involvement to marine environment protection. Amid the fourth industrial revolution, he proposed that the WEF should work with partners to form a global network on marine and ocean data sharing. The leader also hailed international community for backing ASEAN’s common stance on the need to ensure security, safety and freedom of navigation and aviation in the East Sea. On the sidelines of the WEF 2019, the PM met his Nepal counterpart K.P. Sharma Oli, during which both sides agreed to facilitate all-level visits, push forward the signing of an agreement on visa exemption for diplomatic and official passport holders, create favourable conditions for the two countries’ enterprises to seek opportunities in fields of Nepal’s demand such as telecommunications, energy and infrastructure, as well as in fields of Vietnam’s strength like farm produce, food, garment, footwear and electronics. The Government leader also thanked Nepal for backing Vietnam’s run for a non-permanent seat of the United Nations Security Council for the 2020-2021 tenure. Congratulating Vietnam on its improving stature in the region and the world, Oli affirmed that the Nepalese government will continue encouraging and supporting Vietnamese firms in doing business in the country. During a meeting with Director General of the World Trade Organisation (WTO) Roberto Azevedo, PM Phuc affirmed that Vietnam treasures multilateral trade system based on rules and laws within the WTO framework, adding that after over a decade of becoming a WTO member, Vietnam has upheld the spirit of activeness and high responsibility. Azevedo thanked Vietnam for providing effective support in the multilateral trade system and committed assistance to Vietnam in human resources training on global trade and integration. Later, PM Phuc also met executives of multinational corporations.